I am officially fah-reaking out about these scones. Like I cannot even take it. It’s everything you want inside of your omelet and more! Except it’s in a fat fluffy round of bread. With butter. It doesn’t take much to sell me. SO. Here are all the omelet-like things in this scone. Except for eggs of course, because I thought that might be weird. So this is like omelet add-ins. Inside the doughy, butter goodness of the scone. These scones are perfection and I won’t subject you to my rant on how I used to hate scones until finding this recipe. I’ve said it at least sixteen times. These ones… have a ridiculous amount of flavor. Like sautéed garlic mushrooms, spinach, onions (kept raw for some crunch, that’s what I was told I had to do, but diced tiny so they aren’t offensive), chives, white cheddar and a boatload of bacon. With all the butter and buttermilk that comes along with a good scone. I can’t even help myself. Oh but wait. When Eddie ate one, he spread grape JAM on it! At first I thought he was insane and at first I think he assumed it was a biscuit. He loves scones and biscuits with jam and not really any other way, so after taking a plain bite, he smothered it in the pureed fruit. I dunno. Initially that sounded horrific but I can always get behind a good savory-sweet combo and have made plenty of egg sandwiches in my day with fig jam or apple butter or what not. You definitely don’t NEED the jam though – as these are filled with so much fabulous flavor and the cheese gets all melty and you can just shovel one or two into your mouth because they’re ridic. They may not look like much buuuut… they are pretty much my lifeline right now. Preheat the oven to 425 degrees F. In a large bowl, whisk together the flour, sugar, baking powder, soda and salt. Set the bowl aside. Cook the bacon until crisp in a skillet. I like to cook mine over medium-low heat. Remove the bacon and place it on a paper towel to drain excess grease and cool. Remove most of the bacon grease from the skillet, leaving about a tablespoons. Heat it over medium-low heat and add the chopped mushrooms. Cook just until they are soft and juicy, about 5 minutes. Stir in the garlic and then scoop the mushrooms into a bowl. Add another teaspoon or so of the bacon grease to the skillet and add the spinach. Cook just until the spinach is wilted, then remove it and place it in a bowl. Measure out the grated cheese, snipped chives and diced onion. Add the cold butter pieces to the flour mixture and using a fork, pastry blender or your finger, mix the butter until small pieces remain and it is well incorporated. 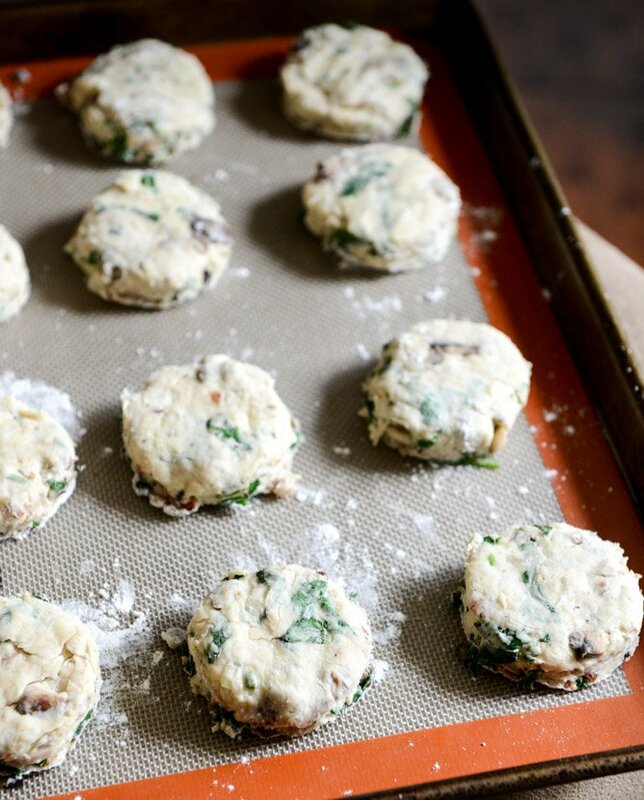 Stir the bacon, mushrooms, spinach, cheese, chives and onions into the dry ingredients with the butter. Immediately add the buttermilk and stir with a large spoon to mix the dough and bring it together. I eventually used my hands. If the dough is super wet, add a few more spoonfuls of flour. Once the dough is manageable, place it on a floured surface and pat it into a circle that is around 1-inch in thickness. Use a biscuit cutter to make rounds, forming the dough into another circle again when there is no room left. Place the scones on a baking sheet and brush the tops with melted butter. Bake for 12 to 14 minutes, or until they are fluffy and just slightly golden. Whipped Double Chocolate Chip Chia Pudding. Great idea! I love savoury scones, but cheese can get a bit boring after a while. I think its time to move on! 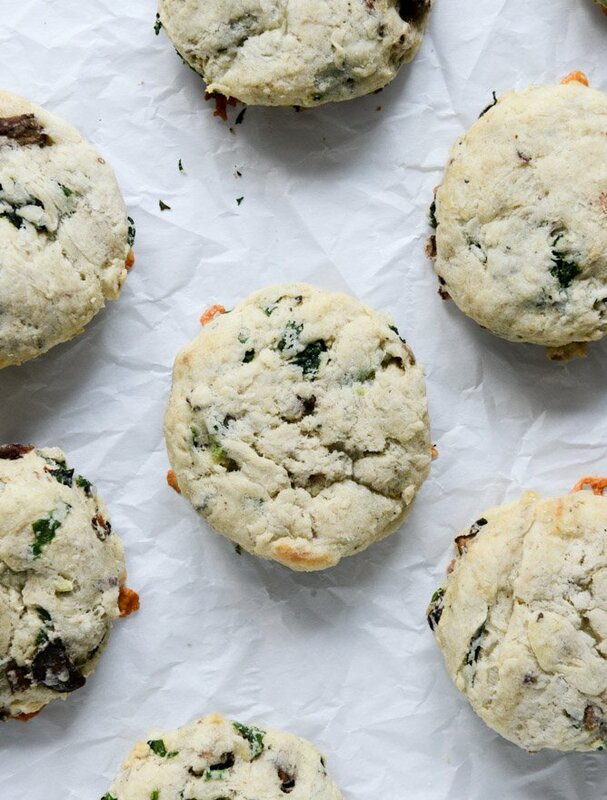 I would have never thought to make Omelet Scones, brilliant! Scones are on my to make list! Thanks! I stumbled across these today and on whim I made them. I’ve been on a scone kick for a while now and had to make these. Great recipe!! These look so lovely and make so many! I wonder if I could freeze them? What do you think? These are in the oven. They smell amazing. Perfect single lady dinner? I think so. I can’t wait.